Goodison is an old fashioned stadium with around 3,000 away fans in one corner of the two tier Bullens Road Stand, at the side of the pitch If you’re in the lower tier, you could be lower than the actual pitch, which makes the view pretty bad. The seats are the old wood type and gaps between rows tight. The facilities are basic and showing their age. Away fans can make some noise from this area, giving a great atmosphere. Pies available are Scouse, Steak, and Cheese & Onion. Also sold are sausage rolls and burgers, Chang lager, bitter and small bottles of white wine. Alcohol isn’t sold 15 minutes before kick off; expect big queues at half time. Liverpool means ‘The Beatles’, The Beatles Story at Albert Dock is a tour through their lives, with memorabilia and input from friends and family. The Cavern Club (Mathew Street) is where the Beatles began. A lunchtime beer or live music in the evening is on. The childhood homes of John Lennon and Sir Paul McCartney; Mendips and 20 Forthlin Road are National Trust properties. Liverpool has the most museums outside London. The Museum of Liverpool is the largest newly built national museum in Britain at the Pier Head. Many other museums are around Albert Dock, like the Merseyside Maritime Museum, where you can discover the city’s seafaring past. There are many art galleries and free art exhibitions. The Liverpool Walker Art Gallery is the national gallery of the North, with works by Hockney, Degas, Turner and Rembrandt. Tate Liverpool at Albert Dock, housed in a Grade 1 listed converted warehouse stages lots of free as well as paid-for art exhibitions featuring work by everyone from Tracey Emin to Picasso. The Echo Arena (L3 4FP) hosts the Sports Personality of the Year on the Sunday night. Tickets are £49.50, with the show being presented Gary Lineker, Clare Balding and Gabby Logan. The pantomime Aladdin is there 15th – 24th December, tickets are £12.50 – £29.50 with family tickets £58 – £68. Saturday night from 6pm at the 02 Academy (L3 5UF) it’s ‘Christmas At The Academy’, tickets are £7.90. Popular hotels in the city centre are The Adelphi, Holiday Inn, The Nadler, The Adagio or for those on a budget, The Printwork Hotel. The only places near Goodison Park are St Hilda Hotel, The King Harry Bar & Hostel and Stanley Park Hotel. Behind the Park Stand is a small fanzone serving food and alcohol. A 15 minute walk away from the away fans entrance is a decent sized Wetherspoons, ‘The Thomas Frost’ (L4 4AJ), with home and away fans in there without issue. Nearby are ‘The Spellow’(L4 4EN) and ‘Winslow Hotel’ (L4 4EH). Taxicab Drivers Sports & Social Club (L4 6UF) charges £1 for entry and has cheap beer and a friendly atmosphere. The city centre is good for a pre-match drink, There are loads of pubs; near Lime Street Station – ‘The Vines’ (L1 1JQ) next to the Adelphi; nearer Goodison ‘The Fall Well’, is a Wetherspoons across the road from Lime Street Station, and at the station itself, is the North Western (L1 1RJ) another Wetherspoons, and the nearby ‘Crown’ (L1 1JQ), who do an extensive food menu. There are two ways to Everton, through mid Wales (180 miles) and motorways (237 miles), both take about the same amount of time. If you arrive about two hours before KO there’s street parking around Walton Lane. Alternatively park over towards Anfield or in Stanley Park itself for £10 (the entrance to the car park is in Priory Road). At the Walton Lifestyles Sports Centre (L4 9XP) you can park for £7. It’s a 15 minute walk to the ground with a Chinese chip shop on the way. Parking there you’re away from the traffics jams after the match at Stanley Park, and just 5 minutes from the motorways. The main station is Lime Street and over 3 miles from the ground, either head for Kirkdale station or get a taxi (about £8). The best way from the city centre on public transport is the Merseyrail Northern Line to Sandhills to catch the Soccerbuses. 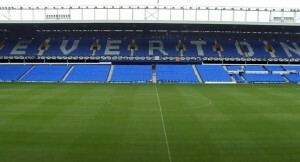 If buying train tickets in Liverpool, ask for a return to Goodison Park, as the train ticket is valid for the Soccerbus. Both Sandhills & Kirkdale stations can be reached by getting a train from Liverpool Lime Street to Liverpool Central, changing there. After the game you may want to grab a taxi into Liverpool, or walk to Kirkdale station. The Soccerbus is normally very full, plus you can wait up to 30 minutes due to big queues, then 20 minutes or so for the bus to make its way from the ground. Trains to Liverpool Lime Street are 10:29, 10:55, 11:28, 11:55, 12:29 and 12:54 for the 4.5 hour journey. There are no trains back after the game, so an overnight stay is needed.